By your mid-20s, you should start concerning about your skin condition. This is when wrinkles, find lines and other tell tale signs of aging tend to become apparent on your skin. It is never too soon or too late for you to include anti-aging products in your daily skincare routine, as anti-aging products are often considered indispensable by those aged 25 and above. Hence, no matter if you are in your mid-20s, 30s or above, it‘s always the right time to get your hands on some anti-aging products! But, are you aware that applying a mask, even twice a week provides a glowing boost to your regular skincare regimen? Masks are highly concentrated with hydrating essence and are much more effective in terms of nourishing our skin. 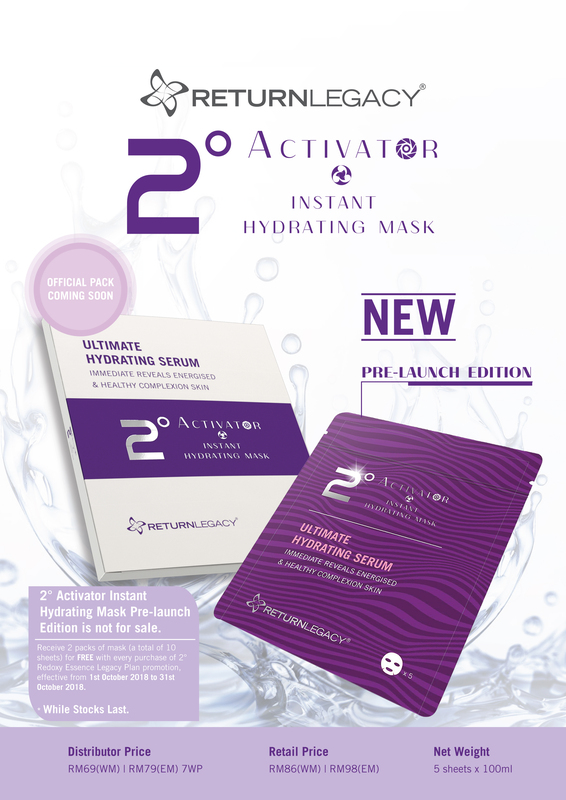 Not only that, the 2° ACTIVATOR Instant Hydrating Mask is specifically formulated to reduce the signs of aging and improve skin conditions, The mask’s ultra thin facial sheet ensures that it covers and adheres perfectly on the surface of the skin. With Micro – Mineralised Nutrient Technology (MMNT) and excellent moisture absorption, the generous amount of anti-aging essence is effective in reducing wrinkles and fine lines, It also contains Laminaria Digitata Extract to help prevent the surface of the epidermis from losing moisture, giving your skin long lasting hydration. Love your skin and your skin will love you too. Spare just 10 – 15 minutes twice a week, and you will soon witness the difference. – Apply sheet evenly across the face for 10 – 15 minutes. After removing the mask, use fingers to gently pat and massage the essence into skin for better absorption. Suggested use – Twice a week. – For those with sensitive skin, use a patch test on the inner arm or the area behind the ear to test for any irritation. It is recommended to test for any form of allergic reaction before use. 1. Please keep out from reach of children to prevent ingestion of the product. 2. If signs of discomfort or persistent swelling occur after use, discontinue using immediately and contact your skin specialist. 3. Not suitable for use on irritated skin or wounds. 4. Not suitable for use on infants and children. -Keep in a cool, dry place and away from direct sunlight.